Ladies and gentlemen, boys and girls, children of all ages…the circus is beginning! Fierce Lion and speedy Zebra are stepping into the ring to perform their act—but wait! Things aren’t going quite according to plan! Zebra is on the go—with Lion in hot pursuit! 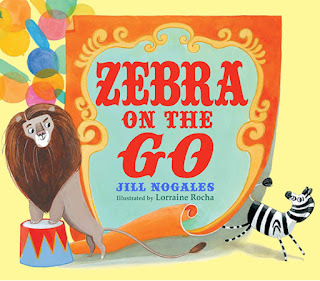 Jill Nogales’s rollicking debut keeps readers on their hooves— er, toes—while Lorraine Rocha’s vibrant illustrations bring the whole circus to life. An energetic read-aloud about the circus running away…with itself, Zebra on the Go hums with energetic rhyming text and is the perfect read aloud for all ages. Debut illustrator Lorraine Rocha adds densely-packed, colorful artwork and an engaging seek-and-find element (keep an eye on those monkeys!) for a book that young readers will want to read again and again. Don’t worry if you haven’t got your tickets yet, because this colorful cavalcade is careening into town on April 1st to set up the Big Top at your local library, indie bookstore, or Barnes & Noble!